I was speaking in Georgia that particular weekend. On day two of the retreat I woke up early and turned on the water in the beautiful tiled shower. As it heated up I noticed that the showerhead was mounted on an off-centered pole. It seemed very low, and was spraying straight along the plane of the wall. What a difference! I was totally giddy … grateful that I could stand tall as I finished up. Not overly bothered by the fact that I was still hugging the wall to catch the water stream. The space was amazing! I was free to move. Free to stand tall. Free to relax. And free to finish what I’d started with a fresh joy and gratitude. This is as important for you and me today as it was for the people of the early church back then. As I considered my funny shower challenge I was reminded that a few small spiritual tweaks each day can make all the difference too. As a Jesus lover, I have the opportunity every day to step into the fresh grace of God - to be washed in His goodness. As I do He showers mercy and faithfulness over me that renews my soul. When I open my heart in prayer, His Spirit connects me to the path of His will and convicts me toward His holiness. These moments of connection and conviction cause me to consider the condition of my heart as well as the circumstances that surround me. I’m forced to assess soul situations, my emotions, edgy responses, unkind words, missed opportunities, snippy attitudes, and the myriad rebellion I’ve got going on. As the Spirit of God brings these matters to me I address each one, then ask the Lord to lift the showerhead of my heart up a little or over a bit. To align it in a spacious place where I can stand tall and free for the day ahead. His grace meets me in the asking. And in the grace of Jesus, my soul finds room to breathe. I’m renewed. Positioned to move in a joy and gratitude that is rooted in His never-ending love. Tired of going through the motions when it comes to your relationship with God? Ready for a more vibrant walk with Jesus? Learnhow to grow in faith, power, and impact according to the Word of God. Order your copy of I Want It ALL today from Amazon, Barnes & Noble, ChristianBook.com or your favorite retailer. 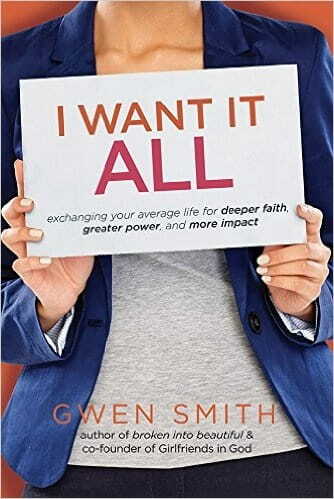 Click here to download a FREE sample chapter of Gwen’s new book I Want It ALL.